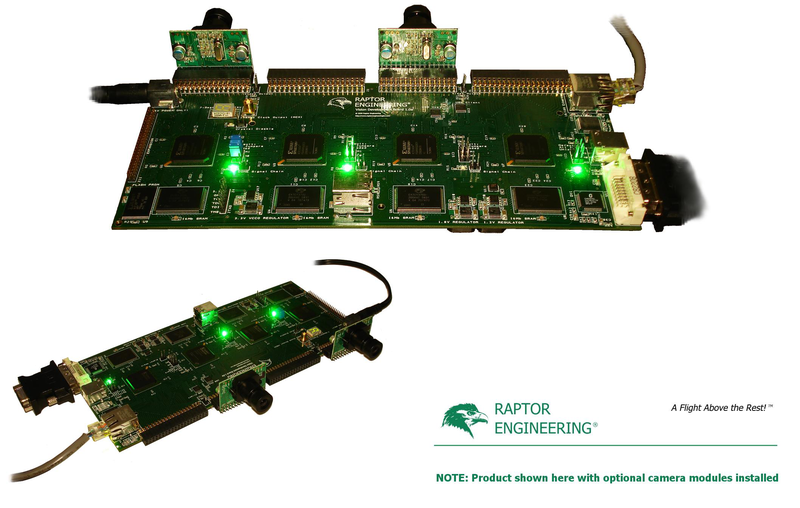 The Raptor Engineering Machine Vision Development Board [VDFPGA] is a high performance Spartan 3A-based [XC3S1400A-FG484] FGPA development board, designed for demanding video processing and transmission applications. This board utilizes a fully paralleled architecture, with each of the four FPGAs having access to an independent 2MB 36-bit wide SRAM device, as well as a shared 36-bit data bus for data transmission between the four FPGAs. Additionally, one shared 25MHz clock, three dedicated inter-FPGA data links, one DVI port, one Ethernet port, two USB ports, and several expansion headers are available for use. Click on the image in the upper right corner for a larger view in a new window. Product is shown here with two optional camera modules installed. NOTE: Due to the number of configuration options offered, each board will be custom assembled to your specifications. This may result in a lead time of up to four weeks. Also note that FPGA4 must have access to 4MB of SRAM in order for the provided reference designs to operate.